2.4 GHz transmission frequency, Bluetooth wireless, around 33 ft. operating range. 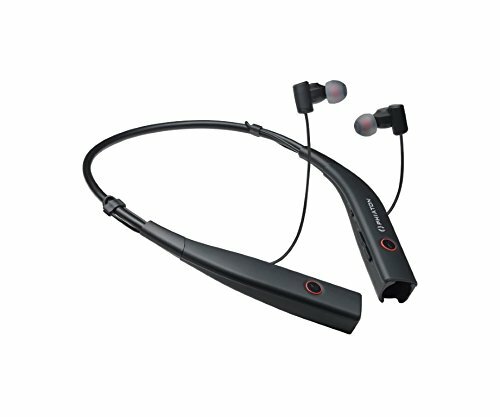 Auto power off function when in Bluetooth mode with noise cancellation feature turned off. Earphones can be stored on collar when not in use. Manufacturer claims water resistance. NFC Bluetooth pairing. Allows simultaneous connection of two Bluetooth devices (ex: watch a movie on a tablet and answer phone calls from smartphone). Defeatable power on/off, Bluetooth pairing, and battery status voice announcements. Defeatable vibration mode to provide notification of power on/off, incoming calls, and when unit goes out of range of a connected Bluetooth device. Supports voice activated dialing when used with Bluetooth capable cell phones that have that feature. Bluetooth connected Apple mobile devices using iOS Version 5 and above will show the battery level.